What are the some of the top reasons that people do not exercise? Lack of time stands out as the number one cause for most of these millennial busy bees. Followed by lack of energy, other addictive distractions, lack of motivation, no access to training, lack of visible results and some simply find exercising overwhelming! For these millennial busy bees we reintroduce the age old yogic practice of Surya Namaskar as SunUps. What better way to start your day than with a complete mind and body wellness routine that can fit into a busy schedule! SunUps has a personality of a trainer/coach to guide you through this simple and easy to understand 12-step exercise routine. SunUps does not require any fancy equipment and can be done at your home. You can learn, follow along or practice this routine using the SunUps app on your phone. Once you no longer require detailed instructions, you may choose to follow along the voice coach to maintain a consistent rhythm as you perform SunUps. Choose the number of sets you wish to do along with Fast (Cardio Mode) and Slow (Toning Mode) options. SunUps can track your exercise routine, keep a count of your sets, and motivate you to make this exercise your daily health habit.You can earn stars for completing your goals, view calories you burned doing SunUps. SunUps can help you set reminders, view and proudly share your streaks with your friends and family and encourage them to foster this healthy habit. Soulful flute music and chants help to create a mind and body connect and enhance this practice. Each of the 12 SunUps poses have 12 corresponding mantras (chants) recited in honour of the Sun. SunUps can be done with or without the mantra chanting. However, chanting the mantras transcends this yogic practice into a spiritual practice. The mantras have a powerful effect on the mind and body through their power of vibration. SunUps when done before you start your day helps you keep your energy levels high throughout the day. Start with one SunUp and increase the sets as you feel comfortable. 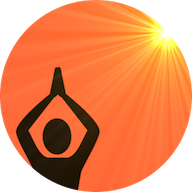 As a routine practice, 12 sets of SunUps are sufficient. The music and chants create an enriching experience to help you connect your self with your mind and body and help you relax and prepare yourself for a busy day. Follow SunUps with other yoga poses if you wish, and then rest in Corpse pose. Relax your body and mind with awareness using the guided relaxation track provided. You may use the guided relaxation track to relax yourself whenever you feel stressed or anxious. A Chair SunUps variation can be done right at your desk to help you stretch. Simple stretching routines done mindfully at a very easy pace help you with spatial awareness and improves focus. We envision a healthy world where everyday is a yoga day. Lets make the world healthier one SunUp at a time. SunUps is available in all countries in English on iOS, Android and also as an Alexa Skill (“Alexa Begin SunUps”). Seek your Doctor’s advice before doing any exercise. Do SunUps, Do Your Mind & Body Good !